Westport is home to two of the biggest hedge funds in the world. There’s Bridgewater Associates, the $160 billion firm with offices on Weston Road and the Sherwood Island Connector, and a workplace environment that is, well, unique. There’s Axe Capital, which exists only on the Showtime network, but is also — supposedly — based here. It’s a riveting drama about life in that ferocious industry. Folks who know such things say the similarities between Bridgewater and Axe are no coincidence. But long before those two titans settled here — decades earlier, in fact — Jerry Fine set up a hedge fund in Westport. Charter Oak Private Equity’s offices were in the Wright Street building. In fact, Fine says, he was the first tenant when that controversial complex opened in 1976. By then he was already well into his Wall Street career. A Wharton School graduate, he spent a couple of years working in an investment bank research department. He was just 24 when he and two other slightly older Wharton alums founded their own fund. Fine and his artist wife moved to Westport in 1970. They needed space for their growing family, and loved the town’s diversity and focus on the arts. He commuted to New York for six years. But he wanted to spend more time with his kids, and less time on the train. So he formed Charter Oak, and has been on Wright Street ever since. He learned from his few mistakes, and did exceptionally well. In 2014 though, he gave investors all their money back. He converted Charter Oak Partners to a family group called NCN. Now he spends every morning managing those funds. But Fine is not exactly retired. For the past two years, he wrote a novel. 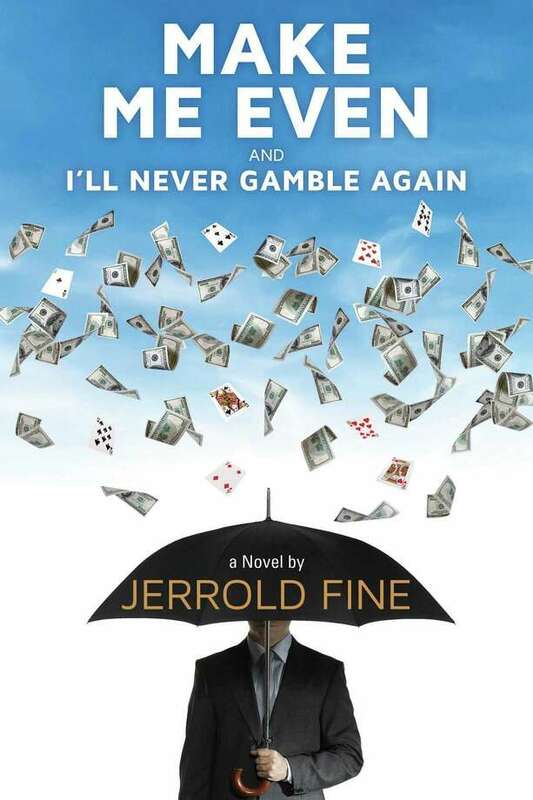 “Make Me Even and I’ll Never Gamble Again” will be published Aug. 14 by Rosetta Books. Part of Rogers Stout — the main character — is Jerry Fine. The novel is set in Cincinnati, the author’s home town. He played baseball there, and thought he was pretty good. But another guy in the same city and grade named Pete Rose got much of the attention. Fine has not played poker since he got married. But, he notes, the game provides many lessons relevant to running a portfolio. Fine says he has always been a storyteller. When his children were young, he created characters for their bedtime stories. Each one got a different tale. Some went on for years. He loves a challenge — what hedge fund manager doesn’t? — and thought about writing a book for years. He did not, however, want it to be about himself. “The world does not need another ‘Jerry Fine Story,’” he says. Which is how, for the past couple of years, “Make Me Even” emerged. After lunch, Fine turned off his phone. For three hours every day — and all day Saturday, and during vacations — he wrote. It was a challenging process. But, Fine says, “I embraced it. It was very important to me that this be well written.” He learned how to think and talk like Rogers. Some part of the character includes the writer’s own life experiences. Much of Rogers, however, was created by Fine. On the days the process worked well and words flowed fluidly, Fine felt exhilarated. That was not always the case, of course. Fine rode the writing roller coaster. At Charter Oak, he led a strong team. He only hired people who were partnership material, he says. Writing is much more of a solo effort. Besides his 94-year-old editor — a former head editor at Bantam Books — Fine was on his own. He was also in completely new terrain. A hedge fund, he points out, is a place of constant competition. There are benchmarks to surpass, other managers to out-perform. He did it. The hedge fund founder’s first novel is about to hit the shelves (and Amazon).